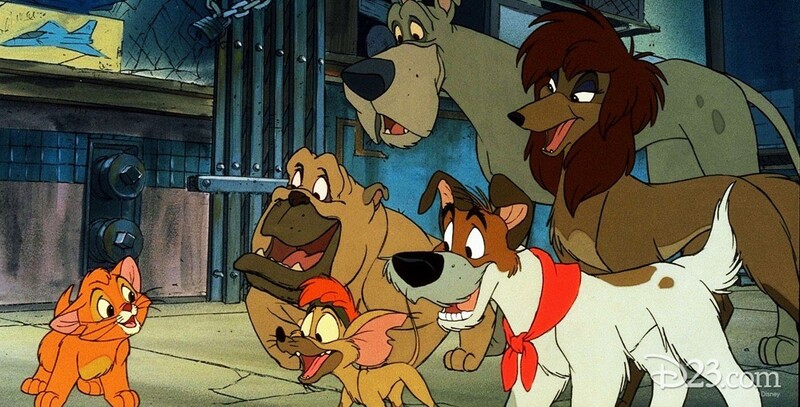 Oliver & Company (film) The Oliver Twist story animated with a twist—the setting is New York and Oliver is a kitten and Fagin the human master of a pack of pickpocket dogs. When a wealthy little girl from Fifth Avenue finds Oliver and takes him uptown to live in her mansion, Fagin’s evil boss, Sykes, steps in and kidnaps the pair. His nasty plan is foiled however, when Oliver’s motley crew of dog buddies, aided by Jenny’s prissy poodle, Georgette, decide to use their street savoir faire in order to rescue their feline friend. Released on November 18, 1988. Directed by George Scribner. 72 min. With the voices of Joey Lawrence (Oliver), Billy Joel (Dodger), Cheech Marin (Tito), Richard Mulligan (Einstein), Roscoe Lee Browne (Francis), Sheryl Lee Ralph (Rita), Dom De Luise (Fagin), Robert Loggia (Sykes), Bette Midler (Georgette). Twelve-year-old Joey Lawrence would later go on to become a teenage heartthrob on Blossom. Six supervising animators and a team of over 300 artists and technicians worked for over two and a half years to create this hand-drawn feature film in the time-honored Disney tradition. More than a million story sketches and drawings were required to produce the 119, 275 hand-painted cels that comprise the finished film. Designers went to New York and photographed street scenes from a dog’s perspective—18 inches off the ground—getting stares from passersby but providing excellent reference material for the layout artists. To give the backgrounds a contemporary and hard-edged look, Xerox overlays were used, the first time for this approach since One Hundred and One Dalmatians. Many of the inanimate objects in the film were created and animated on the computer—cars, cabs, buses, Sykes’s limousine, Fagin’s trike (part scooter and part shopping cart), a cement mixer, a sewer pipe, a spiral staircase, a piano, subway tunnels and trains, cityscapes, and even the Brooklyn Bridge. This was the first film to have its own department set up expressly for the purpose of generating computer animation. Many different songwriters contributed to the production, including Howard Ashman and Barry Mann (“Once Upon a Time in New York City”), Dan Hartman and Charlie Midnight (“Why Should I Worry?”), Barry Manilow, Jack Feldman, and Bruce Sussman (“Perfect Isn’t Easy”), and Dean Pitchford and Tom Snow (“Streets of Gold”). Re-released and released on video in 1996.